VirRansom is a new type of ransomware that replicates like a virus. Ransomware is bad enough on its own. It’s a type of Trojan that allows attackers to take control of the user’s computer. Attackers then demand the user pay a ransom to get control of their computer again. A common way criminals deliver ransomware is via a drive-by download – a type of Trojan horse. Users visit a malicious website and the website downloads the malware to the user’s system. Some ransomware is embedded in other software similar to a typical Trojan horse. 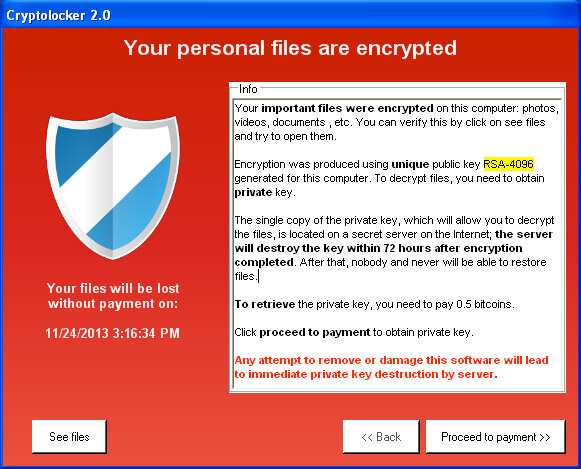 Two ransomware viruses that have attacked many people are the Police Virus and CryptoLocker. 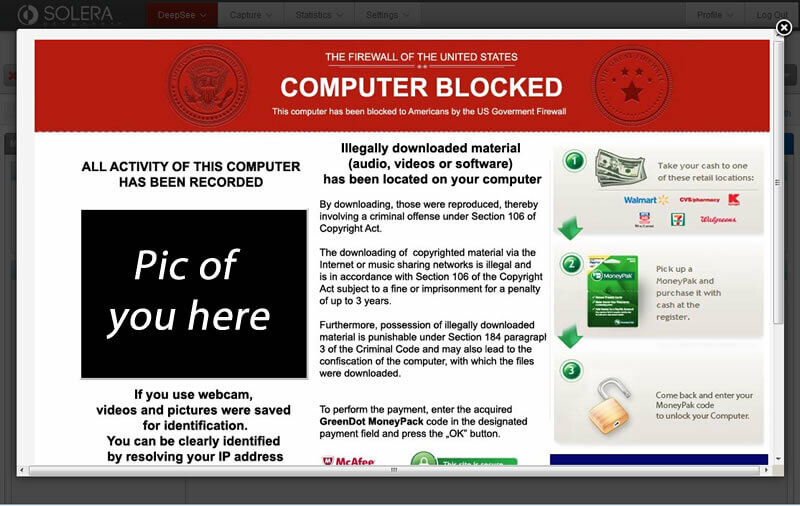 Here are some screenshots of some known ransomware. This one accuses you of illegally downloading pirated materials. If you have your webcam enabled, it will have captured pictures or video of you displayed in the window. Cryptolocker doesn’t bother accusing you of illegal activities. Just as a mobster might kidnap a family member and demand ransom, Cryptolocker kidnaps files on your computer and demands a ransom. However, criminals have gotten more aggressive with ransomware and have combined virus capabilities with it creating a new hybrid which SophosLabs has tagged as VirRansom. But this new ransomware isn’t just malware, it’s a virus – a true virus; a self-replicating parasite that spreads of its own accord. Once it gets into your network, even if it infects only a single computer, it may soon end up all over the place, even if no-one opens dodgy attachments or already has zombie malware infections waiting to be exploited. A parasitic virus, in contrast to a worm, doesn’t spread merely by making copies of itself. Parasitics find other programs and modify them to include a copy of the virus, using the original file as a host or carrier. In other words, if a single user in the network engages in unsafe computing practices causing his computer to become infected, it will quickly spread throughout the network. It includes worm components to spread across the network. When it reaches another computer, it uses virus capabilities to infect computers on that computer. In many instances, it will infect hundreds or even thousands of files on the infected computer. KnowBe4, an IT security company, posted an informative article on their blog about this hybrid. In it, the included some good news and some bad news. The good news: The file encryption is not as advanced as CryptoWall, as the key to decrypt the files is contained in the malware itself. Your antivirus should soon be able to decrypt the files and restore them, unless the bad guys are constantly changing the encryption keys in which case it may take a day or more before your AV catches up. The bad news: This is a full-fledged virus which will spread across your network and doing a less than perfect job on the disinfection can easily lead to reinfection of your whole network. And the bad news is consistent. The good guys find ways to protect systems from malware and the bad guys find ways to circumvent these protections. It’s a battle that we’ll be fighting for the foreseeable future. Don’t open attachments from unknown sources ( malware can be embedded into many different files, such as Portable Document Format (PDF) files, Word documents, Zip files, and more).